Give your PC the Windows 10 look. Choose your settings, then apply the Windows 10 look. Windows 10 has been announced, which means the moment you upgrade to it on its final release you’ll find yourself having to acclimatise to yet more change. The Windows 10 Transformation Pack is designed to give you a flavour of the next generation of Windows through applying a selection of different tools, patched system files and more to provide an approximation of the new OS. What it offers are the following changes: login screen, themes (choice of Metro, Glass or Modern), wallpapers, cursors, icons, fonts, sounds, virtual desktop, new Windows 10 Start menu and more. 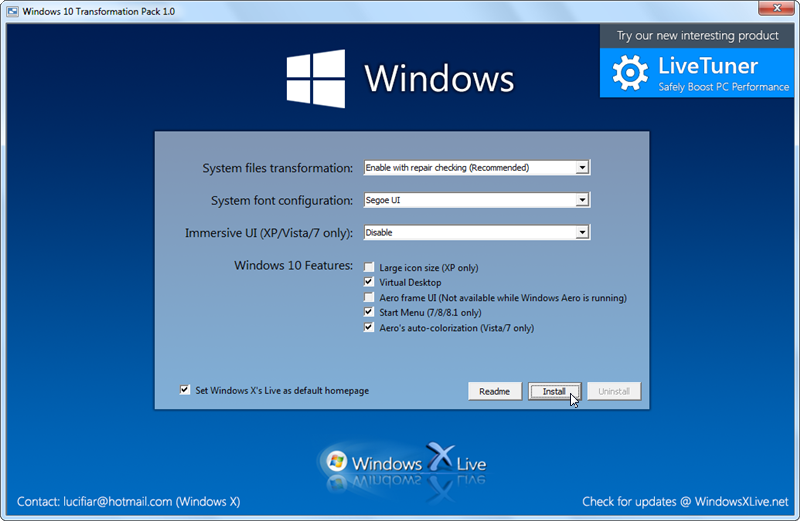 The Windows 10 Transformation Pack works with all versions of Windows from XP upwards, and makes major system changes in order to get closer to the look, feel and behaviour of Windows 10. That’s the only way Vista and XP users can achieve the Windows 10 look, but those running Windows 7 or later should check out the less invasive UX Pack instead. Start by taking a System Restore point – just in case – then download the zip file. Once downloaded, unzip the setup file and double-click to get started. You’ll see the Pack offers a number of different options, allowing you to experiment with what effects you want and how they’re implemented. Start with the default and move on from there. The results are superficially similar to Windows 10, but you won’t be getting the full experience. But despite the fact that Microsoft has now made the Technical Preview publicly available for Windows 10, there’s still value to trying these out – so long as you’re backed up before you begin and take that all-important System Restore point, you can try out the Windows 10 look on your current system. If you’re desperate to get a glimpse into the future of Windows without installing the Technical Preview, this is the way to go for Vista and XP users; we suggest Windows 7 and 8 users go for the less invasive UX Pack option instead. Give your Windows 7 or Windows 8 PC the Windows 10 look.